OLD TOWN — A developer celebrated the significant rehabilitation of 100 affordable apartments for seniors and people with disabilities Monday. U.S. Rep. Danny Davis and Ald. Walter Burnett (27th) lauded the modernization of Evergreen Towers I as a step that will ensure residents in the area can remain in their neighborhood for years to come. 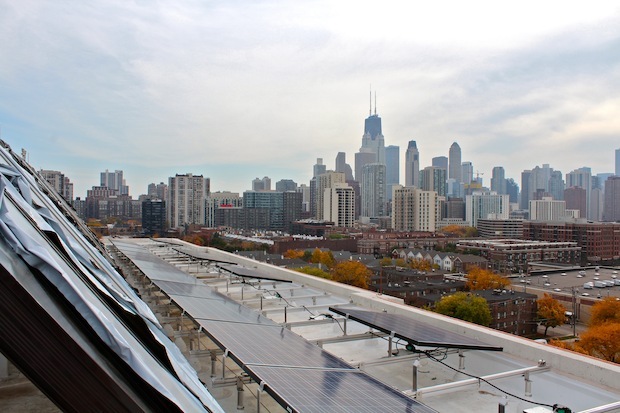 The 10-month rehab project included adding solar panels to the roof of the 11-story building, adding a solar thermal water heating system, LED lights in common areas and other energy-saving measures. The project also included installing new kitchens and bathrooms in all 100 of the building’s units. The building, which was built in the ’80s at 1333 N. Cleveland Ave., provides housing for seniors and people with disabilities making less than 60 percent of the area median income. “This rehab is providing us with the opportunity to increase our residents in this area, especially our seniors and low income community members,” said Izola Woods, director of the Near North Development Corporation. The rehabilitation was a joint effort between the development corporation and UP Development, a venture by Cullen Davis, son of developer Allison Davis. The project, which was funded through a variety of measures including low-income housing tax credits from the Illinois Housing Development Authority, cost more than $26.1 million. The Illinois Housing Development Authority chipped in $17.46 million in the form of tax credits, rental subsidies, tax-exempt bonds and federal money.